• Designed specifically for those preparing for city, local, or state Law Enforcement agency academies. 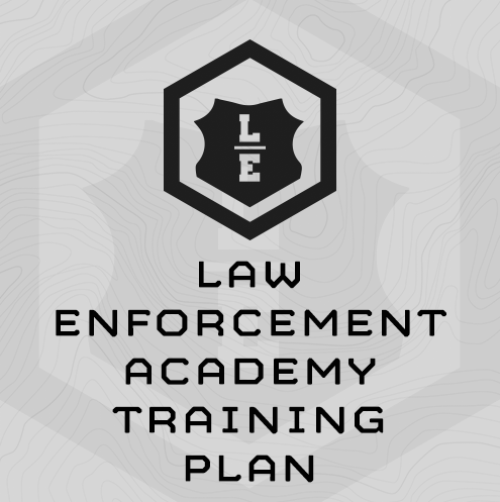 This 7-Week Training plan is designed to build a solid level of “Base Fitness” for those preparing to enter Law Enforcement Academies. This includes city police, sheriff deputies, state highway patrol, etc. While the department you’re preparing for may vary slightly in day to day fitness demands, we found all departments follow a para-military approach to their respective academies. This means unloaded running, calisthenics, and obstacle courses. This plan varies from our normal LE Athlete fitness attributes, as you are training specifically to meet and exceed the demands of the academy. Complete the plan in the seven weeks directly before your academy start date… it includes a “deload” week so that you are well recovered before checking in to the academy. Once you have graduated, we recommend you move on to our daily LE Athlete programming for job specific physical training. This plan was built in April, 2017.
Cooper Physical Fitness Test – We found several academies use this as their physical fitness test, or a test modeled after it. It consists of a Vertical Jump test, 1RM Bench Press, Sit Ups, Push Ups, and a 1.5 Mile run – all of which are assessed and developed with interval training based specifically on your assessment results. Chassis Integrity – Functional, transferable core/mis-section strength and strength endurance for mission performance and overall durability. Start again where you left off. Don’t skip ahead. I don’t work a 5 on, 2 of schedule. How should I train? For weeks 1-6, try to train 4 days in a row and get 3 full days of total rest. For weeks 7-8 try to train 5 days in a row and get 2 full days of total rest. It’s okay if you have to split up your rest days. Do your best given your schedule. You may have to train on a off-duty day and rest on a duty day. I work 10-12 hour shifts. When should I train? Before your work day begins. This is the only time you can count on. How do I know if I’m fit enough to start this plan? Under the “Sample Training” tab, you’ll find Week 1 of this training plan. Complete this week of training. If you survive, you’re ready for the rest of the program. But I’ve never lifted weights before…. Time you started! The weight lifting exercises in this training plan are not complicated or super unique. On our Exercise page you’ll find videos and explanations of unfamiliar exercises … start there and also search youtube and other resources for exercise tips. Be resourceful. For the barbell-strength exercises, start light and be smart. Keep at it you’ll get stronger. There’s no hurry. What does 2/4x Pull Ups mean? 2x for female athletes, 4x for men. Female athletes use 15#, male athletes use 25#. I’m overweight. What about diet/nutrition? Click HERE for our nutritional guidelines? Some exercises call for kettle bells and some for dumbbells. What if I just have dumbbells? Every exercise that calls for kettlebells can be completed with dumbbells, and vice versa. You may have to convert the loading, so if the plan calls for kettlebell swings at 16kg, and you only have dumbbells, use a 35# dumbbell. Be resourceful. (2) Find Bench Press 1RM. (3) Max reps Sit-ups in 60 sec. (4) 300m Sprint for time. (5) Max reps Push-ups in 60 sec. (6) Run 1.5 miles for time. Use the below chart for loading …. 4x Power Clean - increase load until 4x is hard, but doable. Run 100m - easy to moderate pace as you warm up. (1) 6 Rounds, every 75 sec. (2) 6 Rounds, every 75 sec. (3) Run 300m for time. Sprint 100m @ 100% effort. (1) 3 Mile Run at a “Moderate” pace. Moderate = comfortable but not easy.